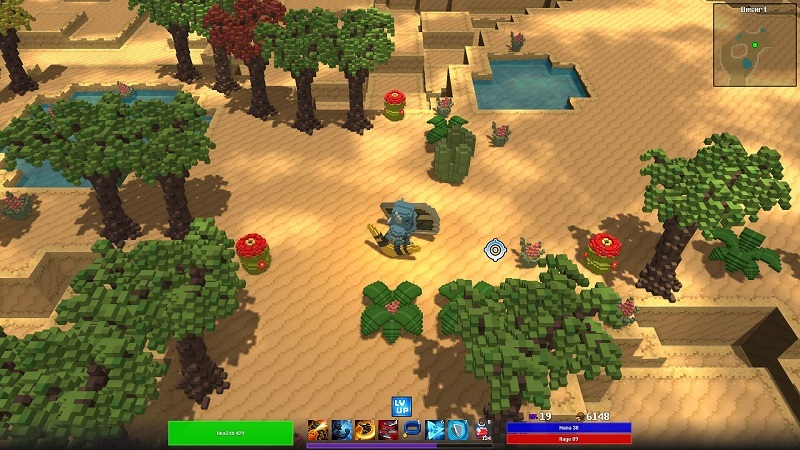 Forge Quest is a action RPG in the style of a dungeon crawler. You start by picking a class and customizing the look of it if you desire. A quirky adventure through randomized dungeons is what follows. The story is somewhat simplistic. Your character is off to train to be a real hero, with a rival to motivate you along the way via various insults. There are a few surprises along the way though. The humor is a bit hit or miss, but It does hit the mark occasionally. While the voxel style graphics may turn some people away, I found them to be charming. It certainly captures the feel of an old style game. The environments are nicely detailed and don't feel sparse at all. The world and maps are randomized for each character, and you have the option to rebuild them if you choose, but I found some "set pieces" seem to always show up, just in different locations. For example, on my mage I played pretty straight forward. After I made it to the first real boss, I started over and played a Warrior type character for a bit. This time I made sure to explore every inch of the map. As a result, I found two new events I hadn't seen before. One was a giant bee, and another was a powerful sword. At least, it was for the time I found it. I then went back on my mage, and sure enough I found the bee on the same area, and the sword on the same exact floor, just in different locations ON said floors. So while the layouts change, it seems there are some things that you can always expect to find. While I played with a mouse and keyboard, there are options for controllers as well. One controller option lets you move with one stick, while the other stick controls which direction your character faces. On the keyboard and mouse this translates to movement on the WSAD keys, while your character faces the cursor, allowing you to aim one way while running in another. This allows you to keep on the move as you fight foes. 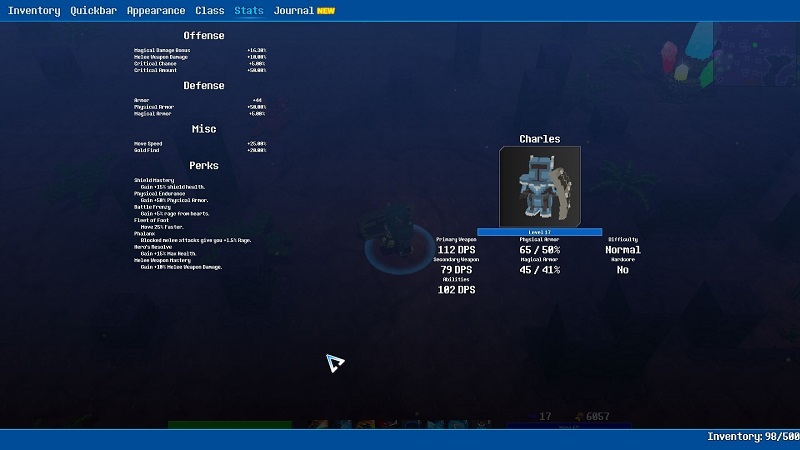 Items such as potions, as well as your abilities are on the number keys, shift allows you to block, left clicking attacks with your primary weapon as well as interacts, while the right mouse uses your secondary. I found the controls to be quite fluid and handy when attacking with range, allowing me to effectively strafe around enemies. You can also do a dodge roll with the space bar. You have two slots for weapons. While you can mix it up as you please, I found it most effective to keep one that dealt physical damage, and other magic. 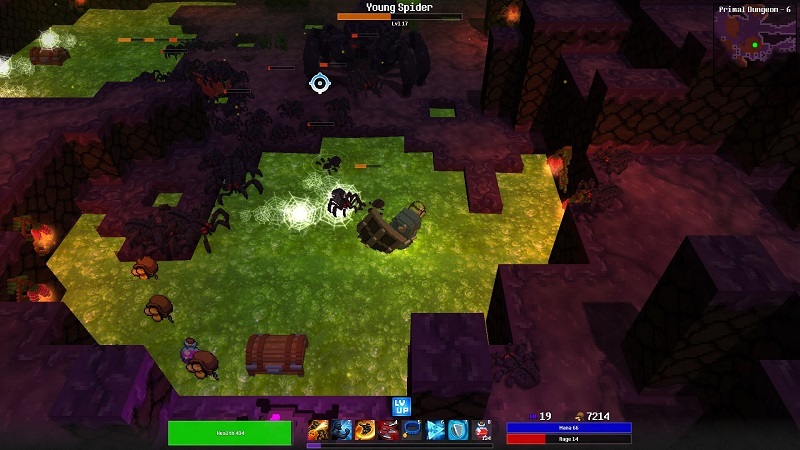 Some enemies can be resistant to one or the other, and in later dungeons they can be immune. If you were armed with just physical weapons and encountered a physical immune enemy, you might be in a predicament! Weapons, as well as armor, can be powered up through the crafting system. The crafting system basically amounts to recycling gear you aren't using along with gems you find to power it up. while there is a limit to how far a item can be powered up, this is incredibly useful to keeping your armor and weapons suitable for your dungeon if nothing good has dropped for you in a while. Its also something good to do with gear you'd normally just sell. I really liked having the option. Enemy types are nicely varied, each dungeon adding something at least a little new. Somewhat early on I had an annoying encounter with Frost King Wolves. On their own they weren't much different that any other enemies. However they could heal themselves and others. Not bad on its own, but one time I died repeatedly because I was trapped in a room with three of them. They would keep healing each other at the perfect intervals, along with other monsters, to be nigh invincible. Normally, You could just lure one or two away and dispatch them without the back up. But this was in room in which you couldn't backtrack out of. I was able to get past by opting into the beta branch of patches, one of which allowed the wolves to still heal, but only other enemy types, making them a much more reasonable threat. Another Annoying enemy found later was a type of fungus monster, that spit blobs. Even if they missed you they would coat the ground. If you had 3 or so chase you to a dead end it or in a room with a tough monster it could be a tricky situation. The bosses were fun to fight, one of the first ones reminded me of classic Zelda games. It was a centipede monster in which you had to attack its backside as it wandered around, each segment lost making it go faster and harder to hit. The difference was you were being attacked by little monsters while still trying to run around and hit it. Even though some of the fights were fairly straight forward affairs involving dodging attacks and defeating smaller monsters before you got overwhelmed, they were all fun and I really liked the designs of them. The class system is rather simple, allowing you to make a customized build. Your character you start off with is just a template of sorts. There are three main options, Warrior Mage and Rogue. Putting 7 points from leveling up in any one of these branches unlock the two other teirs for that option. I went mostly warrior for example, but put a few points in rogue to unlock the ability to move faster. My favorite weapon to use had a high arc, and would sometimes miss enemies chasing me. Once I could move faster the weapon became much more useful. As far as weapon types go, there are several to choose from. Alchemy Bombs roll along the ground and explode, or you can charge them to lob them high and then they explode on the ground, doing a good deal of Area of Effect damage making them great for clearing crowds. The sword does a spin attack when charged, and some weapons, such as the bow or throwing daggers are rapid fire, rather than allowing to charge. While shields mostly share the same functionality they come in a few different designs as well. Runes are often found in chests or occasional dropped from foes and give a variety of effects. You can increase your gold find rate, armor, pet duration, or other effects by slotting the correct gem into the proper socket on your gear. If you lack the socket, you can add it at a crafting station. You can combine runes with other runes and gems to level them up much like arms and armor. This will boost the effects they give, which you can see a sum of on the status screen. Upon completing the game on Normal, you can move on to Intermediate, and so on. Each bump in difficulty lets you keep your gear but resets the story and makes the monsters stronger in each dungeon. All in all, it makes for a fun RPG if you don't mind the gameplay mechanics and graphical styles of a time gone by. If you like crafting and exploring games, Crea is one you should definitely check out.